We all know how helpful guide dogs and white canes can be to the blind and vision impaired community … but how about electronic readers, GPS locators and UltraCanes that vibrate when they sense an object? 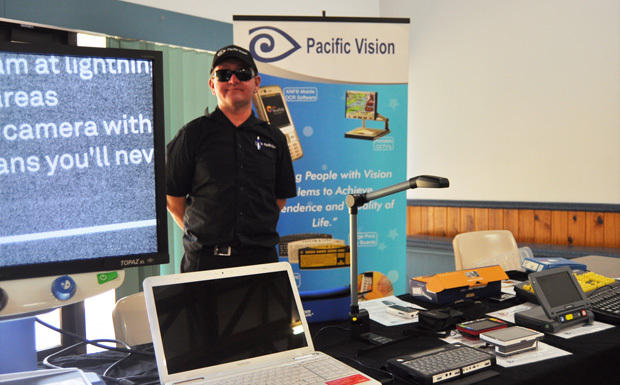 Breakthroughs in electronics have been incorporated into many of the rehabilitation aids which were on display today at Kingaroy’s first “Low Vision Mobility Expo”. There were talking GPS units, which can be used to map out areas; magnification screens; sonar canes and even a prototype Streetlight cane which can provide a pool light to help guide vision impaired walkers at night. The expo, organised by Guide Dogs Queensland (GDQ), was held at the Lakeview Friendship Centre (the Senior Citizens building) in Kingaroy. 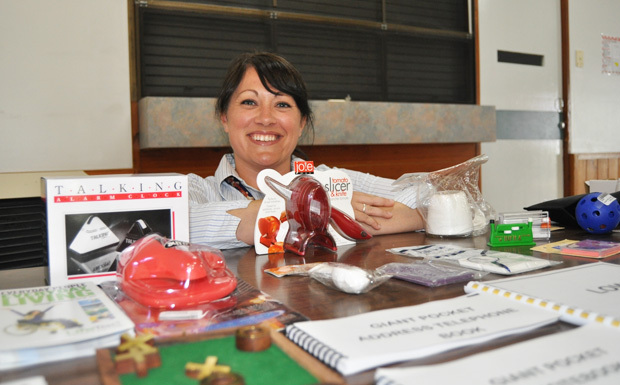 GDQ Rehabilitation Services Manager Bashir Ebrahim said the organisation often sent out instructors to work with clients in the South Burnett but this was the first time an expo – which shows the range of assistance devices available – had been organised in the area. He demonstrated many of the devices that are now available to assist people with low or no vision. 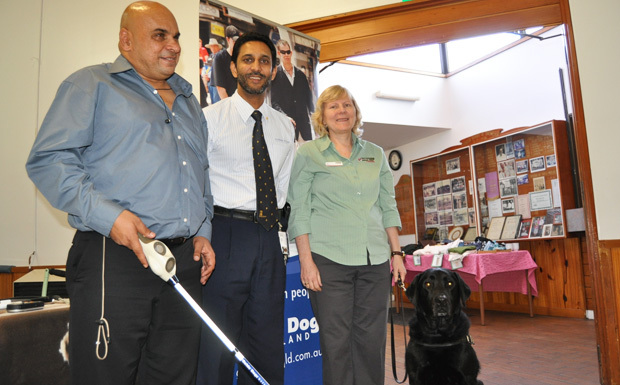 GDQ Adaptive Technology Co-Ordinator Haroon Probst demonstrates an UltraCane with Rehabilitation Services Manager Bashir Ebrahim, Kim King and "Buddy"
Mr Ebrahim, who has been awarded an Order of Australia Medal for his work with the blind and vision impaired community, said clients were introduced slowly to the new technology. He said the aim was “safety and success”. The clients’ needs and skill levels were assessed. Training can then be organised in the South Burnett or clients can stay for short periods at GDQ’s live-in facility at Bald Hills in Brisbane. All the items and training assistance are provided for free by GDQ on a needs-based system. Mr Ebrahim told the story of a client who lived on a farm west of Bundaberg. This man had a sudden loss of sight, basically overnight. Now with aids and training provided by GDQ he can still manage his property and look after his three daughters. A talking GPS unit allows him to walk to the gate, follow fencelines, etc. A number of the visitors at today’s expo were long-term clients of GDQ who just dropped in to catch-up on the latest equipment available. People with elderly parents were also attracted to the displays to see which items could be useful.